This section is about fish, not fishing. Explored is the aquatic life of the Lake and its tributaries, not a sport. Twenty-two species are found in Kootenay Lake: one sturgeon, five minnows, two suckers, ten salmonids (three of which were introduced), one cod, and three sculpins. The first is the white sturgeon. The minnows are: lake chub, peamouth, northern pikeminnow (northern squawfish), longnose dace, redside shiner. The suckers are: longnose sucker, largescale sucker. The salmonids are: western cutthroat trout, rainbow trout (steelhead), sockeye salmon (kokanee), brown trout (introduced), bull trout, brook trout, lake trout (introduced), lake whitefish (introduced), pygmy whitefish, mountain whitefish. The cod is the burbot. The sculpins are: prickly sculpin, slimy sculpin, torrent sculpin. Because many species are quite inaccessible, this treatment will be uneven. McPhail, J.D. and R. Carveth provide a guide to fish identification in Field Key to the Freshwater Fishes of British Columbia. It treats the Columbia Region on pages 65–89 (the lower Kootenay is the applicable subregion). 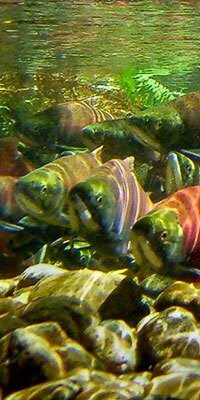 There is also a discussion of sports fish provided by the Royal BC Museum: Fishes of the Columbia Basin.